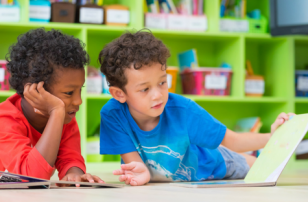 Using words that are easily recognizable, and readily used by your child for letter recognition activities is important. Most all children can identify a road and what goes on it from very very young, so it’s a great choice! Add in a child who loves anything that drives and you have a huge hit! Also finding vehicle stickers is dead easy, they are every where. 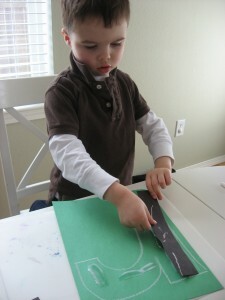 My son loved this craft, when he woke from nap he skipped his usual snuggles and went straight for the table where I had the craft ready. Gather your materials. 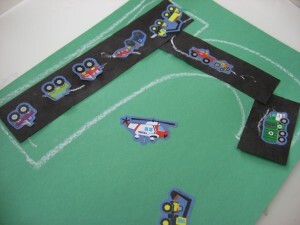 You will need 2 pieces of construction paper ( one should be black) , vehicle stickers, scissors , glue and white or yellow chalk. 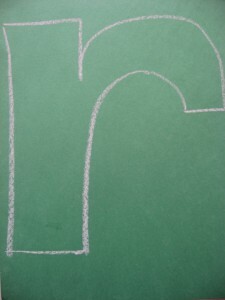 Start by writing a large lowercase ( or upper) r on your green construction paper. 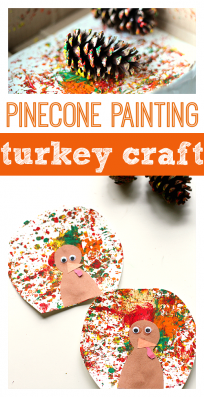 If your child wants to decorate this go for it, it will mostly be covered by the road but if they are game , do it! 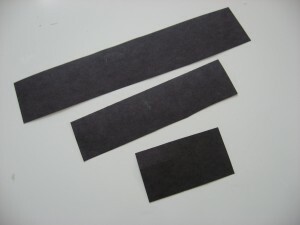 Cut 3 rectangles out of the black paper. I included kid scissors in my picture because I was hoping my son would want to do some of the cutting but he just wanted to hurry to the stickers! 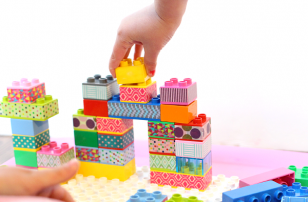 If your child is able, encourage them to do some or all of the cutting. Have your child use the chalk to make road markings. Time for stickers! 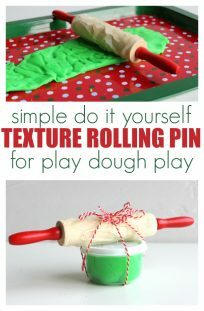 Not only does this add extra fun since for many kids stickers are treats ( I know I use them as treats for all sorts of things) but it also adds great fine motor practice. 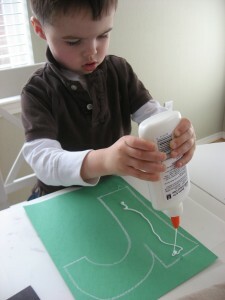 When they carefully peel the stickers off they are using those fine motor skills, so do not do this step for them! Let dry completely then show it off ! Sputter, Sputter, Sput! by Babs Bell is all about a little car that zooms… until it starts to sputter! What could be causing that? It’s out of gas! The story is simple but the illustrations take it from basic story to a quirky and fun book. The concept of up and down is reinforced multiple times but with fresh and fun illustrations by Bob Staake each time. My son enjoyed this book but it was a quick read , I think it would have been a favorite a year ago though , it was a little simple for him now at 3 1/2. It’s definitely worth a look to see the illustrations ! 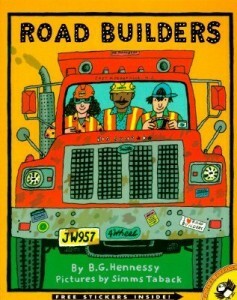 Road Builders by B.G. Hennessy was a birthday gift for my son in November and he was not interested at first. Maybe because of the plethora of lego that was taking over our house… however it has since become such a favorite he recently “read” it to my sister’s dog. It’s a story all about how a road is built , explaining what the crew does, and how each type of construction vehicle has a different role in building a road. 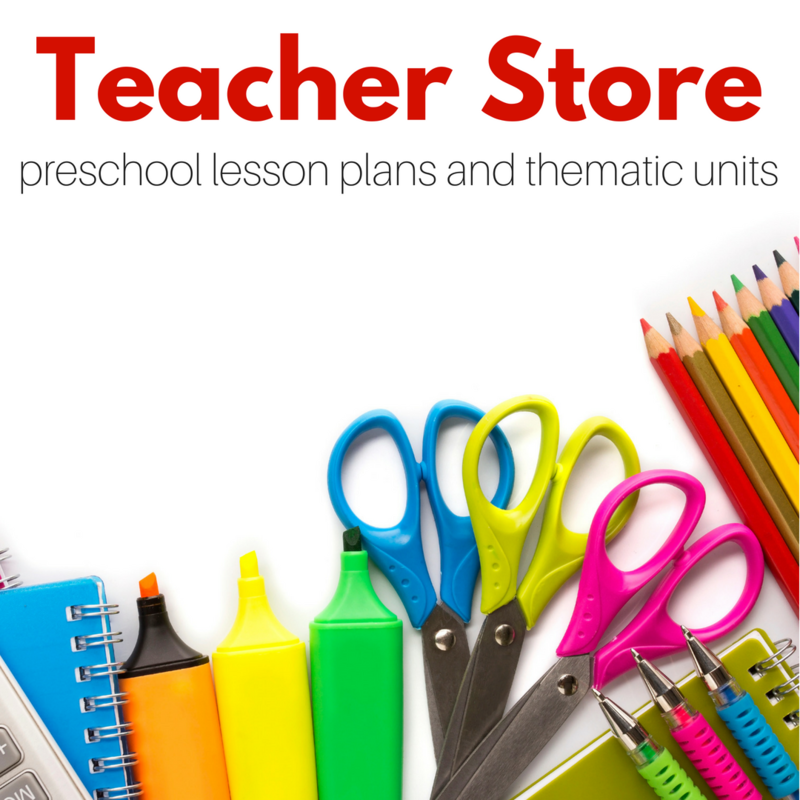 I like that it explains the process from start to finish, in just the right level of detail for preschoolers. I also like that there is a female crew member and her participation is seamless . 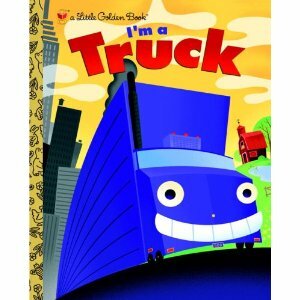 I’m a Truck by Dennis Shealy is about Big Blue Bill a big rig on his way from the Big Tuna to the Big Apple! As he travels along the highway, stops at trucks stops and runs into road construction he visits with his truck friends. Most every type of truck is covered in this book and the illustrations by Bob Staake ( yes the same as above!) are so detailed that you can spend extra time just finding things on each page. All the trucks are anthropomorphized and some hilariously so. I am quite fond of a logging truck named Leif who had a beard and toque ( winter cap for non Canadians ) , he makes me giggle. My son loves the part where Big Blue Bill is stuck in city traffic behind a garbage truck who is stinky! The text is a good length and I have a feeling this will be a favorite for a while at our house. love love love love love it!! will be doing it today!! is one of the letters my little man is less confident with and hes vehicle crazy so this couldn’t be more perfect. thank you!! I’m a truck is my sons favorite book! I love it and read it with a southern trucker accent and he loves it! 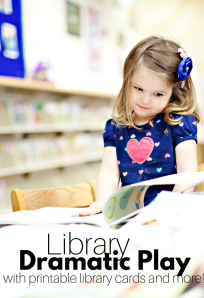 I just found your blog today and I love it! I am so excited to stay home with my son and baby #2 in just a couple weeks and I can’t wait to do all these fun activities with him. Thanks for sharing such great ideas! Wow, I just clicked on a link for your blog through Confessions of a Homeschooler. She had posted U activities, which is the letter we are on and I loved the look of your umbrella craft. I can’t believe I almost did an activity like this road R with my daughters a couple of months ago, but then we ended up doing other things instead. I love the look of your blog and am looking forward to having some time to look more thoroughly. Think we will be using your idea for the umbrella. 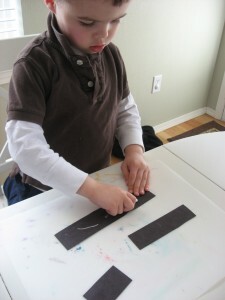 Question: how old was your son when you started doing “letter of the day”? My son is 18 months, and doesn’t seem ready for this yet, but I know you’ve been doing it for a while. Aimee – we’ve done letter of the day since about that age (my 3y/o is an Aug ’06 kid but my 21mo/old has played along for a few months now)… he had no clue what letter it was until he was older, but an 18mo/old can certainly love putting stickers on paper 🙂 . 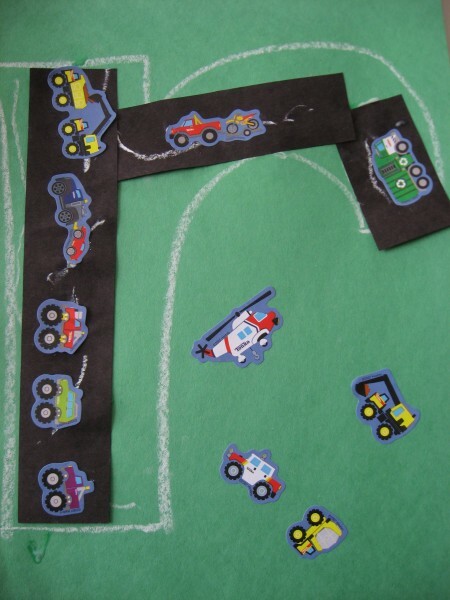 You could just use a black R and add the lines yourself, kiddo adds truck stickers and tah-dah craft. I love how easy it is to adapt Allie’s ideas 🙂 . My son was about 22 months old when I started. I started them at the start of the school year and he turned two at Thanksgiving. That said he was very into letters so he was into making them but some of the steps were still too hard. He had fun but he didn’t really get into them until a few months later after he turned two. Like Nikki said though they are adaptable and fun to do even if they aren’t grasping it all. My advice try it – if it tanks no biggie. Try again in a month. Allie how old should kids be to use scissors? My daugther is 2 and I’m not sure if I should be exposing her to scissors yet or not? I love all your activities. I need to remember though to keep it fun and make sure I don’t get frustrated when things don’t quite go to plan… A skill I need to work on I think. Start her with scissors now. 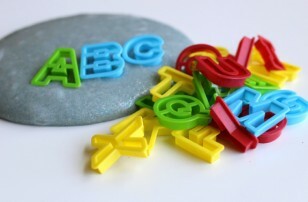 A great way to start is with plastic ones that won’t cut paper , but will cut play dough. Then move up to safety scissors and scrap paper once she can do it. 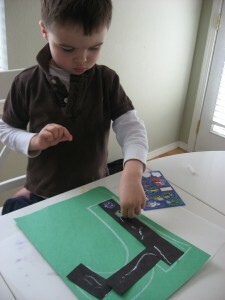 Personally I do the letter activities as he shoes interest in subjects I can make into one. When kids are invested in the subject the lesson is much more effective. So if she is into flowers – do Vase V first for example. The reality is , letters are not in alphabetical order much in daily life except if you are filing something so they don’t nee to be for this either, I like them mixed up so that kids see that . 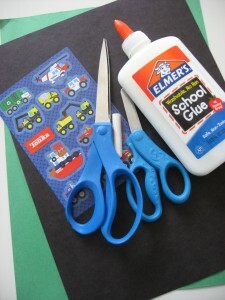 Thanks Allie – I’ll have to look out for some scissors like this. Thanks for the tip about the letters too – she’s obsessed with animals so I might have to do some animals. Thank you for replying to me, I really appreciate it.